One of the most spectacular ancient sites we visited was Mycenae, which has been inhabited since around 4000 B.C. 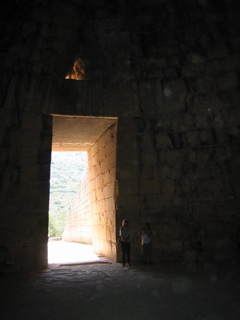 We explored the interior of a tholos, one of the honeycomb tombs of the kings, built around 1300 B.C. The air in the enormous interior was still, and the only light shone from the doorway and the triangular opening above, which was designed to relieve strain on the lintel. This was before the invention of the arch. We took a super-fast hydrofoil to the island of Spetses. What a ride! Despite the high speed, the ride was smooth, and we wanted to stay on the boat longer. Spetses was the place where we had a vacation within our vacation. We spent most of the time on our own, exploring the island, walking in an outdoor sculpture garden, visiting some museums, and dodging the ubiquitous motor scooters, many of them driven by crazy fellow tour members. We were happiest relaxing with a little gelato and a stroll. Just so that you don't have the impression that you can only have Greek food in Greece, we'll share a photo of the pasta Kris ate in a lovely Italian restaurant overlooking the waterfront. We ate with our friends and watched the sun go down and the moon come up. 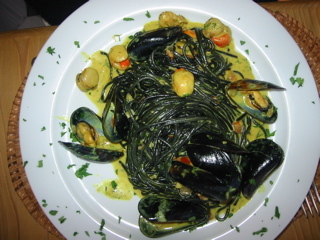 The black color of the pasta comes from the ink of the cuttlefish.